How often do you notice cat hairballs on the floor? Is it daily? Weekly? Both are common, but that does not mean it’s normal. In this article, you will learn the most effective methods to get rid of hairballs in cats. Cats groom themselves to keep clean, and ingest dead hair. Photo by Takashi. Before you learn about hairball prevention, you must understand what a hairball is. Physically, it’s what the name suggests: a ball of hair. How does your cat get one? By grooming himself. Cats groom themselves for several reasons, and one of them is to remove dead hair from their coat. As your cat grooms himself, he ingests this dead hair. 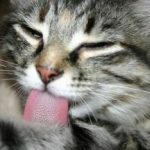 Cats have backwards facing barbs on their tongues and cannot spit out anything that gets on them (except medication, as you know). Therefore, what goes in, must go down. This is the same reason why strings and laces are very dangerous to your cat’s safety. Once down, the hair has two exits–at both ends of your cat. A hairball does not dissolve in the stomach’s acids (and that is good, as hair is not food), so hopefully it will find its way out. Either it will pass through the cat’s digestive system, or it may come back up where it came from. IMPORTANT: There also is a third option called a hairball blockage. This is a veterinary emergency and requires either surgical removal or extensive therapy. The above symptoms are the same with every gastrointestinal foreign body, and they are very serious. 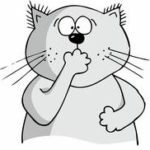 Luckily, in most cases, hairballs do not lead to a blockage; however, if your cat regurgitates a hairball more frequently than once a month, you should do something about it. 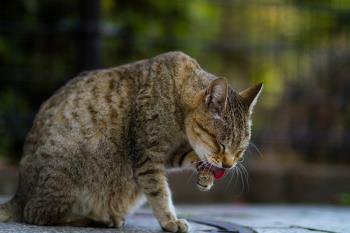 While hairballs may be considered a natural occurrence, the fact is that house cats experience them more frequently than do wild or feral cats. Fortunately, there are some cat hairball remedies that will help to minimize, or even eliminate, the problem. Brush your cat regularly. This removes dead hair from your cat’s body so that there is nothing left for him to ingest when he grooms himself. 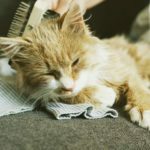 If you have a long-haired cat, there are many reasons to brush his coat on a regular basis. 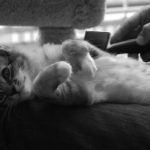 Check here to learn more about brushing a cat. Hank the cat is enjoying Tuna. Wet diet is not only delicious, but it also lowers the risk of hairball formation. Photo by Robert W. Howington. Switch to wet food. In terms of hairball formation, wet food simply helps to pass the hair through your cat’s digestive system. It’s not a 100% cure, but in our observation, a wet diet is the most effective hairball treatment for cats. Use a lubricant paste to help hair pass through. You can find this paste in pet stores or online, and most pastes are flavored, so there are no worries about trying to get your cat to take it. He may even beg for more. Most of these products are intended to be given to your cat on a regular basis (weekly, or so), but read the labels on the package before offering it to your cat. Alternatively, you may use petroleum jelly or cream butter. Increase your cat’s activity. Play with him as often as you can. If you think he’s not the playing type, that’s just not the case. You can find several fun activities for your cat here. Increased activity stimulates bowel movements and helps to avoid constipation, and it improves the overall health for any animal, not just cats. You can find more benefits of playing with your cat here. And again, most cats do develop hairballs. It may not even be a bad thing. However, if you notice a sudden increase in occurrence, it’s a good idea to think about ways to relieve the problem. If you notice any symptoms of cat hairball blockage, do not hesitate to visit a veterinarian.